Soak the sheets of gelatine in a bowl of cold water for 5 minutes to soften them. Split the vanilla bean lengthways and scrape out the inside with the blade of a small knife to get the seeds. Heat the cream with the vanilla seeds and bean in a saucepan over medium heat, without letting it boil. 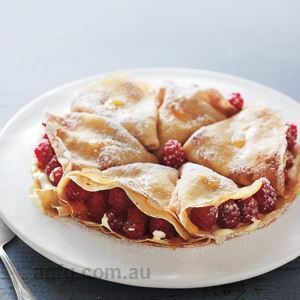 Remove from the heat, then remove the vanilla bean before adding the sugar. Stir well. 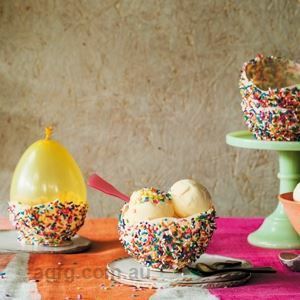 Squeeze out any excess water from the gelatine sheets and add them to the hot cream. Dissolve them, stirring, then let the cream cool. 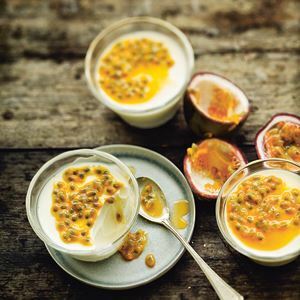 Place some passionfruit pulp in the bottom of each ramekin or serving glass. Pour the cream on top and place in the fridge for at least 3 hours (or overnight if possible) so the cream is fully set. To unmould the panna cotta, warm the bottom of the glasses or ramekins very gently, then turn them over onto each serving plate. 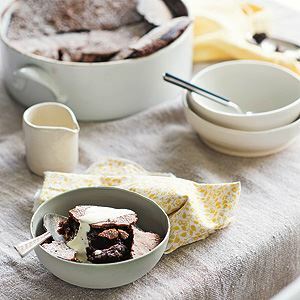 You can skip this step by setting the cream directly in small glasses or serving bowls and pouring the passionfruit pulp over the top. 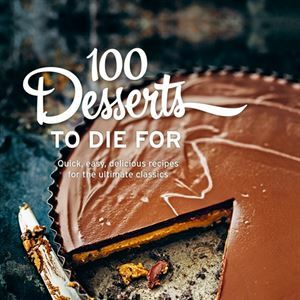 Photo Credits: 100 Desserts to Die For by Trish Deseine (Murdoch Books) $39.99 available in bookstores and online.